Posted on December 13, 2018 by Betsy Jacoby-Greenleaf. Your long awaited show is finally off the ground and running (yes, a celebration dance is definitely warranted) and it’s garnering some much-deserved buzz. All of your booth space has been sold – without even trying that hard – but now you have several exhibitors clamoring to be a part of your show. Sign me up for that please! #Goals. Now you have three choices. 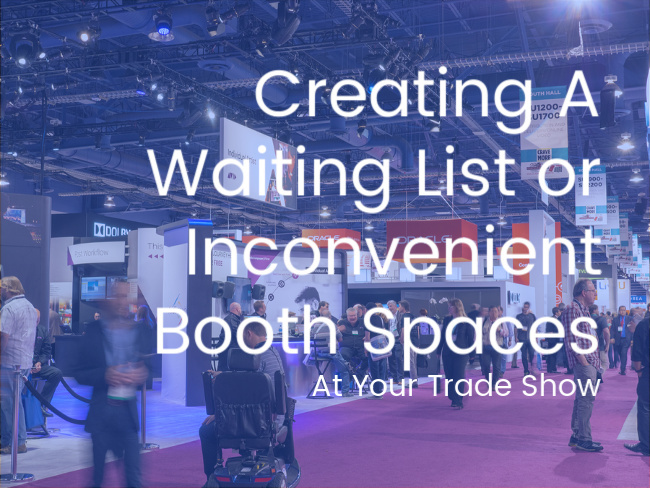 You can ignore them – said no one ever – you could create a waiting list or consider making inconvenient booth spaces. This is a common scenario for show managers that is worth exploring and evaluating, so let’s dive in. When people are faced with a tough decision a pro/con list is what is usually recommended to help clear the muddy water. The problem with pro/con lists is that they often don’t go deep enough. They are based on feelings and projections rather than evidence. And when you are dealing with a decision that can affect your bottom line, it’s wise to evaluate the history of the show and the stats to help you make a better-informed decision. When you have a show that is still in its infancy it can be tempting to try squeeze in as many vendors and exhibitors as you can. The more the merrier, right? Exhibitors are savvy and want to exhibit at a show that has a track record for success. It’s not likely that the inconvenient space that is afforded to them will be worth their time or money. If your show isn’t known in the industry and you don’t have the ROI stats to use as an enticement, you are probably better off using the space you have as it was intended. Getting a new show off the ground and running takes a lot of work and the last thing you need to deal with is complaints from exhibitors over booth space that was lackluster. If you have a show that is in the second or third year and you are starting to make a name for yourself you will want to see that 20% growth happening and it may not feel like the ideal time to cap growth opportunities. However, if exhibitors are not happy with the inconvenient size and location of their booth they might not come back to your show again. Be wary of the one and done exhibitor – word can spread quickly – that can shrink your growth potential. You are probably better off to build momentum with your show and grow your base so that you can expand into a larger space next time. Organic growth is preferable to forced expansion. This is where things start to get tricky. It takes a basic understanding of the fundamentals of supply and demand. Waiting lists indicate exclusivity and when you create the appearance – legitimately so – of a high demand for your show space, it often attracts more business and the cost for booth space will subsequently rise. Here is where you have to be careful. If the cost and demand are too great, exhibitors will naturally look elsewhere because the cost and inconvenience of waiting are too high. Find your show’s sweet spot and then stay there. It can be hard to turn away an exhibitor that shows a keen desire to exhibit at your show. Sometimes it’s less headache to come up with an inconvenient space for them than it would be to say no. Why would an exhibitor be attracted to a space that is in a bad location? For some, it feels worth it for the possible decreased fee. Maybe past attendance to your show is enough to indicate that sales, even in an awkward location, might be worth it. Before selling any extra space always make sure the exhibitors know what they are signing up for and have proof that they understand the risk they take exhibiting in a space that is not prime real estate. If they fail to understand what can happen they might attempt to flake on their bill and your good intentions will have backfired. It’s less risky for both parties if the exhibitor already has a good track record established with you and they know that your show has the ROI to back it up. It can be tricky deciding how to approach our scenario but only you can know what is best for your show. Once you understand the intricacies behind the pros and cons of having a waitlist versus inconvenient places, the choice gets easier. Talking with a trusted professional in the industry to get feedback is always a smart move. Take into consideration not only this year’s goals but also your long-term growth goals. It is far better to crush your goals for two years and then expand than it is to push expansion and get a bad reputation. Two years from now you will thank yourself, trust me.